In 1881, Edison built electricity generating stations at Pearl Street in Manhattan and Holborn in London. Within a year, he was selling electricity as a commodity. A year later, the first electric motors were driving manufacturing machinery. Electricity is a general term encompassing a variety of phenomena resulting from the presence and flow of electric charge. These include many easily recognizable phenomena, such as lightning, static electricity, and the flow of electrical current in an electrical wire. In addition, electricity encompasses less familiar concepts such as the electromagnetic field and electromagnetic induction. Samuel Butler, Hudibras, Part II (1664), Canto III, line 295. Lord Byron, Childe Harold's Pilgrimage, Canto IV (1818), Stanza 23. Thomas Edison, in a statement to a reporter during the first public demonstration of his incandescent (31 December 1879), as quoted in Chronology of Americans and the Environment (2011) by Chris J. Magoc, p. 46. Yet by 1900, less than 5% of mechanical drive power in American factories was coming from electric motors. The age of steam lingered. Tim Harford, “Why didn't electricity immediately change manufacturing?”, BBC, (21 August 2017). Is it a fact—or have I dreamt it—that by means of electricity, the world of matter has become a great nerve, vibrating thousands of miles in a breathless point of time? Rather, the round globe is a vast head, a brain, instinct with intelligence: or shall we say it is itself a thought, nothing but thought, and no longer the substance which we dreamed it. Nathaniel Hawthorne, The House of the Seven Gables (1851), The Flight of Two Owls. Without electricity, there can be no art. Nam June Paik, in "Nam June Paik retrospective, Liverpool" by Emma O'Kelly in Wallpaper (20 December 2010). Alexander Pope, Eloise to Abelard (1717), line 57. William Shakespeare, A Midsummer Night's Dream (c. 1595-96), Act II, scene 1, line 175. Ere one can say "It lightens." William Shakespeare, Romeo and Juliet (1597), Act II, scene 2, line 119. One can prophesy with a Daniel's confidence that skilled electricians will settle the battles of the near future. But this is the least. In its effect upon war and peace, electricity offers still much greater and more wonderful possibilities. To stop war by the perfection of engines of destruction alone, might consume centuries and centuries. Other means must be employed to hasten the end. 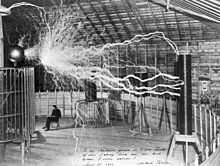 Nikola Tesla, in "The Transmission of Electrical Energy without wires as a means for furthering Peace" in Electrical World and Engineer (7 January 1905). Electric current, after passing into the earth travels to the diametrically opposite region of the same and rebounding from there, returns to its point of departure with virtually undiminished force. The outgoing and returning currents clash and form nodes and loops similar to those observable on a vibrating cord. To traverse the entire distance of about twenty-five thousand miles, equal to the circumference of the globe, the current requires a certain time interval, which I have approximately ascertained. In yielding this knowledge, nature has revealed one of its most precious secrets, of inestimable consequence to man. So astounding are the facts in this connection, that it would seem as though the Creator, himself, had electrically designed this planet just for the purpose of enabling us to achieve wonders which, before my discovery, could not have been conceived by the wildest imagination. Pex Tufvesson, "Mahoney of "Kaktus & Mahoney" in an interview at Remix64 (26 September 2001). Quotes reported in Hoyt's New Cyclopedia Of Practical Quotations (1922), p. 218-19. William Henry Burleigh, The Rhyme of the Cable. Calming the lightning which he thence hath riven. Lord Byron, Age of Bronze, V.
Robed in the lightnings which his hand allay'd. Lord Byron, Age of Bronze, VIII. Charles Ferguson, address reported in Stevens' Indicator, Volume XXXIV. No. 1 (1917). Benjamin Franklin, comment on Tubgot's inscription in a letter to Felix Nogaret, who translated the lines into French. Can hope to rival such as you. And turned the lightning's darts aside. Philip Freneau, On the Death of Benjamin Franklin. And have some welcome news for each. Christopher Morley, Of a Telephone Directory, in The Rocking Horse. That bids the spheres become articulate. A quickened hand plucks off the message terse. Eripuit cælo fulmen, mox sceptra tyrannis. He snatched the thunderbolt from heaven, the sceptre from tyrants. Anne Robert Jacques Turgot, Baron de Laune, inscription for the Houdon bust of Benjamin Franklin. See Condorcet, Life of Turgot, p. 200. Ed. 1786. Eripuit fulmenque Jovi, Phœboque sagittas. Modified from Anti-Lucretius. I. 5. 96, by Cardinal ee Polignac. Eripuit Jovi fulmen viresque tonandi. Marcus Manlius, Astronomica, I, 104. Line claimed by Frederick von der Trenck asserted at his trial before the Revolutionary Tribunal of Paris (July 9, 1794). See Gartenlaube, Last Hours of Baron Trenck.